Dr. Mennemeier is an adjunct faculty member for the Department of Physical Therapy and serves as the Director of Research and Coordinator of the PhD in Physical Therapy Program. 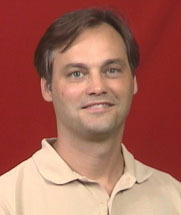 Dr. Mennemeier received his PhD at Southern Illinois University – Carbondale. Dr. Mennemeier is primarily a faculty member in the Department of Neurobiology and Developmental Sciences and the Center for Translational Neuroscience at the University of Arkansas for Medical Sciences. Dr. Mennemeier’s work focuses on the neural mechanisms of attention, awareness, and sensory perception. Specifically, his studies examine how brain injury causes clinical disorders such as the neglect syndrome and how this information can be used to design rehabilitation therapies. Additionally, Dr. Mennemeier uses repetitive transcranial magnetic stimulation (rTMS) to research and treat clinical disorders like tinnitus and to study normal sensory perception.